London is one of the most exciting cities in the world-dynamic, noisy, colourful - and non-stop. It can also be exhausting, crowded and intense. So for those of us who like to stop, breathe and enjoy a slower pace of life, Lost in London is for you. If you prefer to spend your weekends walking on London's commons, or hunting down fireside pubs for a pint rather than frequenting cocktail bars or clubs, then read on. Lost In London first began life as a magazine. From this, its founders Lucy and Tina, have lovingly created a beautiful book that unearths a hidden treasure - the secret side of London. This urban nature guide shows us how to slow down and reconnect with the greener side of the capital. Sections include a guide to exploring the city's reservoirs, cemeteries, and meadows, an alternative look at the Thames and London's lakes, canals and wetlands, and an entire section dedicated to foraging, beekeeping and henkeeping.The book is full of delicious recipes for you to make using your foraged food, such as damson gin, pontack, pork, apple and black pudding pasties and blackberry vinegar. There's gardening advice with suggestions on how to make the most of your allotment, rooftop or window box, practical ideas for outdoorsy day trips, and a brilliant guide to the animals, insects and birds that share our city. Packed with stunning illustrations, gorgeous photography and handy maps, this is an indispensable, inspirational guide to living simply in the city. Lucy Scott and Tina Smith launched Lost in London magazine three years ago over a shared passion for the natural world and reflecting its place in urban life. It was intended to be a oneoff experimental portfolio project, but it quickly established as one of the most foremost independent magazine titles around. Lucy Scott is a nature writer, with an artistic interest in stories that explore how plants, trees and landscapes help us better understand ourselves. She co-created Lost in London magazine in 2010 to explore how to live more sympathetically with the city's wild landscapes. Her creative non-fiction, informed by RHS horticultural training at Capel Manor College, has been published by Royal Botanic Gardens, Kew, Monocoleand The Ecologist. 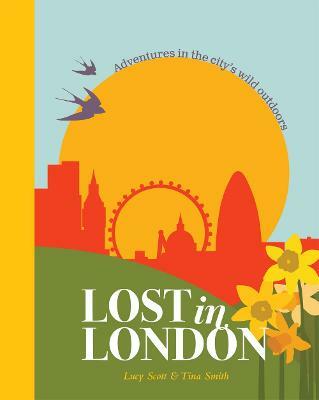 Her first book, Lost in London: adventures in the city's wild outdoors, was published by Portico in 2013.